The Liberal Area Coalition for Families needs your voice. They are hosting a come and go event on Friday October the 12th from 10:00am-2:00pm at Liberal Memorial Library’s Cooper-Clark Room. 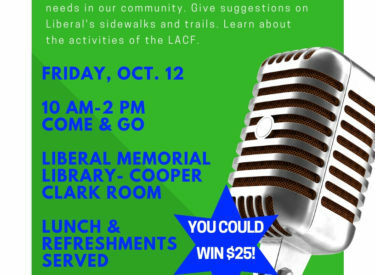 At the event, individuals can get registered to vote, provide input on health needs in Liberal give suggestions on Liberal’s sidewalks and trails and can learn more about the activities of the Liberal Area coalition for Families. Lunch and refreshments will be served and everyone that stops in is eligible to win a $25 gift card in a drawing that will be held at the end of the event.